Keeping your looks is not just about the management of facial lines and wrinkles but also good skin quality and texture. Smooth skin is an indicator of youth and becomes more difficult to attain as the years go by. But help is at hand! The Restylane Vital range restores skin glow and lustre, to refresh your overall appearance. 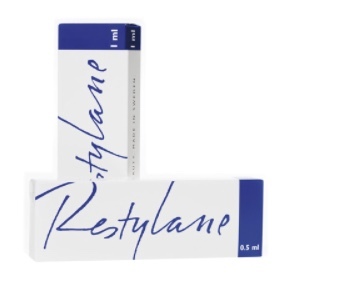 Perfect as a skin nutrition treatment in its own right, Restylane Vital can also be used in conjunction with all the Restylane range to produce outstanding treatment results. Treats the fine lines caused by over exposure to the sun. Boosts the skin's hydration system to leave the skin looking plump and hydrated. Perfect for treating sun damaged skin on the face, back of the hands and décolletage. Both Restylane Vital™ products are now available in Restylane® Injector. Following on from the success and popularity of Restylane Vital™ Light in the pen type injector, the original product in the rejuvenation range, Restylane Vital, is now also available in the Restylane Injector delivery system. Restylane Vital treatment can be demanding and precise work that can require hundreds of repeated doses over large areas of skin. This can be a strain even when using a high quality syringe. After listening to your experiences we developed Restylane Injector to make treatment more comfortable and convenient for you and give your patients the best possible results. Preloaded with 2 ml of gel, one Restylane Injector delivers 200 controlled doses of 10 ?l per injection. 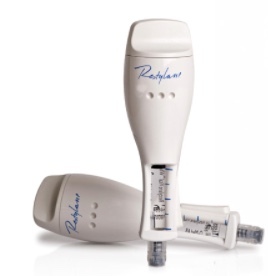 The injector comes loaded with Restylane Vital or with Restylane Vital Light. Even volume distribution over large skin areas for predictable treatment results. Ergonomic design with a firm grip close to the needle for increased working comfort and hand support. Controlled dosage of 10 ?l per deposit that minimizes the risk for overdosing. More focus on placing the needle at the correct depth. Maximum treatment economy with 200 preloaded doses in each injector. Both injectors are now available with the new and innovative Thin Wall Needle. The new needle has improved flow properties that makes each injection with the injector considerably faster and more comfortable. 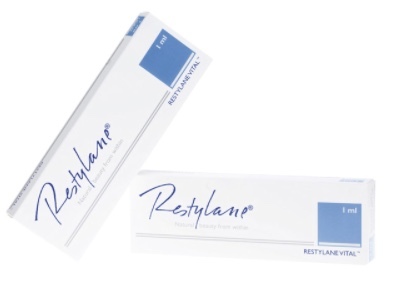 The Restylane family of products includes Restylane, Restylane-Lidocaine Perlane, and Perlane-Lidocaine. These products can be used to add volume and fullness to the skin to correct moderate to severe facial wrinkles and folds, such as the lines from your nose to the corners of your mouth (nasolabial folds). Restylane may also be used for lip enhancement in patients over 21 years. Ask your practitioner which is right for you. Biocompatible with the human body, Restylane is eventually broken down naturally. Restylane is the first and only FDA-approved dermal filler for lip enhancement in patients over 21 years. And that's great news-because who doesn't want beautiful lips? After all, lips play a central role in our sensual and emotional life-think attractive, youthful, and kissable. So it's only natural with all this focus on lips, that lipstick is one of the most-purchased cosmetics. It's also natural to want to enhance the appearance of our lips if we feel that their shape or proportions are not well matched to our unique facial structure. Plus, as we age, our lips may lose volume. And using makeup to hide these flaws often has limited results. Where can the Restylane family of products be used? The Restylane family can be used to add volume and fullness to the skin to correct moderate to severe facial wrinkles and folds, including the lines from your nose to the corners of your mouth (nasolabial folds or laugh lines). The Restylane family can also be used in other moderate to severe facial wrinkles such as lipstick lines- the area just below the nose and above the upper lip; the corners of the mouth; and marionette lines-the area that extends downward from the corners of the mouth to the jawline. After treatment, you might have some swelling, redness, pain, bruising, or tenderness. These are typically mild in severity and normally last less than 7 days in nasolabial folds and less than 14 days in lips. Swelling may be more likely in patients under 36 years, and bruising may be more likely in patients over 35 years. A large percentage of our skin (approximately 56%) is made up from Hyaluronic Acid (HA), a highly absorbent substance that hydrates and creates volume. As we age, our levels of HA decrease, causing fine lines, wrinkles and dehydrated skin. Luckily, help is at hand with Restylane - a HA gel that is injected directly into the skin to boost its appearance. There are a range of products available to suit every treatment need and subtly minimize creases and revive the complexion. NASHA (Non-Animal Stabilized Hyaluronic Acid) is the patented technology which is used in all of Restylane range of products. The hyaluronic acid is stabilized to create a long-acting substance. The stabilization involves the binding together of the HA molecules in a network. Without this modification the hyaluronic acid would only stay in the tissue for days. Conversely, too much modification can affect the HA's most important properties negatively. NASHA is based on a non-animal (biosynthetic) raw material which gives it a high degree of purity. The gel is only stabilized by less than one per cent which ensures a long lasting effect as well as minimal tissue disturbance which reduces the risk of allergic reactions. NASHA's properties also allow it to be integrated naturally into the body so that nutrients, hormones and other vital substances can pass through the gel. Use of NASHA technology is clinically proven, with over 10 million treatments worldwide and an excellent safety profile of 1 in 20,000 patients experiencing an adverse event. Restylane Lipp is designed specifically to create beautifully shaped lips. Restylane Lipp gives your lips a natural fullness and a more sensuous look, leaving them soft to touch and irresistibly kissable. When injected into the lips, Restylane Lipp boosts the skin's hydration system to lift and smooth away fine lines and creates a natural fullness. 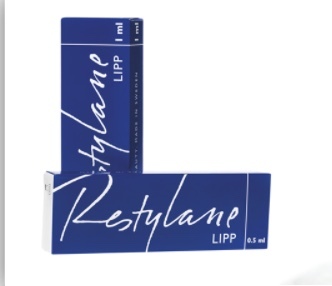 Restylane Lipp is specially formulated to support the lips' everyday movements - like talking, smiling, laughing and kissing, which improves treatment results and longevity. By working naturally with the lip tissue, Restylane Lipp sustains lip definition and fullness over time making it the treatment of choice for lip enhancement. Restylane Lipp can also be combined with other Restylane treatments to enhance your looks, whether you want to banish tell tale ageing frown lines or nose to mouth lines or simply diminish the fine lines above the lips caused by sun damage and smoking. Restylane Lidocaine can also be used for lip enhancement for a more comfortable treatment experience, for more information - contact us for a consultation. Restylane SubQ is injected deeper to add volume and support the overlying tissue, providing facial fullness and restoring symmetry. This treatment is ideal for patients with flattened facial features, or those with an unbalanced or asymmetrical face. It is also suitable for patients reluctant to undergo facelift surgery or the insertion of permanent implants. Meeting the increasing demands from patients requesting less invasive and non-permanent alternatives to plastic surgery, Restylane SubQ also fulfills many requirements of an ideal soft-tissue filler. Deep subcutaneous layer or supraperiosteally. Keeping your looks is not just about the management of facial lines and wrinkles but more about restoring lost volume in the skin. 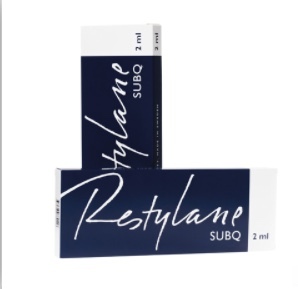 The good news is that Restylane SubQ provides deep dermal support providing help in the skin where it is needed to restore skin volume and give youthful shape and contour to the face. The effect is very natural, leaving your skin feeling firmer but soft to touch. Restylane SubQ is suitable for a wide range of patients seeking to improve their facial shape and definition without resorting to surgery or having permanent implants. Restylane SubQ provides a non-surgical mid face lift. Whilst restoring volume in the skin in the upper half of the face to give a more youthful shape, it also diminishes the appearance of nose to mouth lines, to give a fresher look.